Early occupants of the city’s alternative sleeping location line up for dinner. A settlement has been reached in a federal class-action lawsuit against the city of Laguna Beach over allegations that its homeless shelter discriminates against the disabled. The settlement comes a month before the case filed on behalf of five homeless individuals in 2015 was set for trial before Judge Andrew J. Guilford in U.S. District Court in Santa Ana. Lawyers representing both parties declined this week to describe the terms of the agreement, disclosed in a Thursday, March 29, order vacating the planned trial. The deal, reached with the assistance of Magistrate Judge Douglas F. McCormick, is subject to certain conditions and must be submitted for Guilford’s approval, the order reads. No specific date was set. The settlement comes against a backdrop of litigation over homeless issues locally playing out elsewhere and a recently released study measuring the economic impact of homelessness in Orange County. Pressure on county government to solve homelessness comes from a different federal judge, David O. Carter. His threat to block enforcement of anti-camping laws provoked a backlash, with supervisors balking over the use of county-owned land in three cities for displaced inhabitants of a Santa Ana River encampment. And Laguna Beach faces another legal challenge over its 2009 entry policy at its homeless shelter, granting priority to those with local ties. Oral arguments in the U.S. Court of Appeals for the Ninth Circuit in Pasadena are set for Monday, April 9. Computer consultant Leonard J. Porto III, a Laguna Beach resident who once lived out of his car, absorbed enough civil procedure from library law books to file his own lawsuit in 2012. Now, Annie Avery of the University of Nevada Las Vegas law school, will argue on his behalf, her professor, Anne R. Traum, confirmed this week. Relying on law books borrowed through the local library, Leonard Porto is challenging the city’s policies towards homeless people. His case is being heard next week. In the appeals proceeding, the court typically takes the matter under submission and issues a decision at a later date, Kohn said. Laguna Beach homeless advocate Jim Keegan said the terms of the settlement in the Santa Ana suit will make a substantial change for the disabled homeless seeking to make use of the Laguna shelter, though he also declined to discuss specifics. In January 2017, lawyers representing three homeless and disabled plaintiffs in the case said they were willing to dismiss their lawsuit alleging that the policies and homeless shelter in Laguna Beach violates the Americans with Disabilities Act if the city will commit to 25 demands. Those demands included the city’s commitment to build permanent supportive housing units, according a proposal, which was rejected by city officials. Other demands included designating a coordinator to ensure that the shelter is ADA compliant, establishing a mechanism to address complaints by those who say the shelter is inaccessible, providing elevated cots for those with disabilities, providing restrooms in the parking lot for those who the 45-bed shelter can’t accommodate and establishing and posting clear policies about who will be given access. 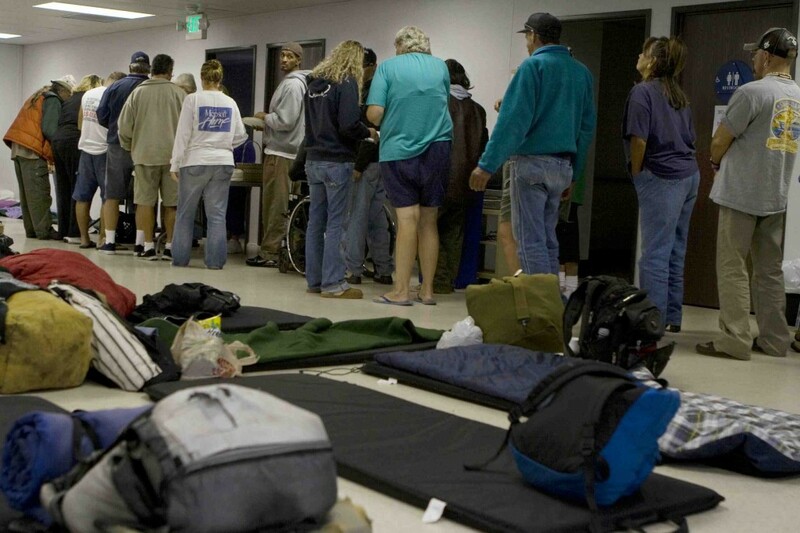 Laguna Beach opened its 45-bed, year-round overnight homeless shelter in Laguna Canyon in 2009, the first municipally operated facility in the county. Its catalyst was a legal settlement over much the same issue confronting Judge Carter. Then, litigation challenged the legitimacy of the city’s anti-camping statute absent an alternate location for homeless individuals to sleep. A new study is one of the first to show the economic cost of homelessness in Orange County. It also debunks some long-held sterotypes. Its findings based a 2015 census show that of 4,500 people on the streets, they are primarily longtime residents of the county made homeless due to insufficient income, job loss and the high costs of housing. The annual cost of providing services for homeless who are placed in permanent supportive housing is 50 percent less ($51,587) than for the chronically homeless living on the streets and in emergency shelters ($100,759), according to Homeless in Orange County: The Costs to Our Community. The year-long study drew on a range of data sources, including county government and 34 cities, hospitals and nonprofits and 252 in-person interviews. It was conducted jointly by United Way of Orange County, UC Irvine and Jamboree, a low-income housing developer in Irvine. Given the escalation in housing costs, a new census will likely detect rising homelessness but still fail to capture those unhoused who are living in cars, hidden encampments or those staying in a motel for a night or two, the study predicted.